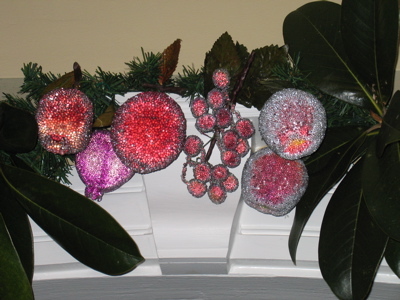 They make a great hostess gift, if you ask me, those sparkly, old-fashioned fruit ornaments. They look pretty good clustered in a glass bowl as a centerpiece, too. Of all the ornaments that we’ve collected over the years, the fruits seem to be the most versatile and festive. I hang them on ribbons dangling from the chandelier over the dining room table. The glass beads catch the candlelight and sparkle like frost. I hang them in the artificial pine roping that swags the arch in the library. With a few magnolia leaves thrown in, the effect is of an evergreen frame for the tree which sits beneath. Yes, I know, they are just so much glass beads and styrofoam, but when Christmas approaches, it’s visions of sugared plums, pears, apples, cherries and pomegranates that fill my head. Magical…. that’s exactly the word I was looking for. I hope to put a little magic into my children’s Christmas! Peak of Chic is correct once again. These are wonderful!